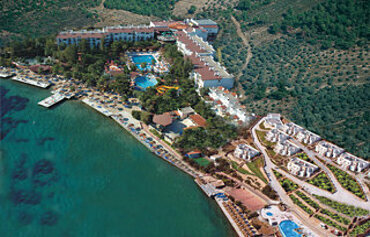 The Ersan Resort & Spa was built with family holidays in mind. 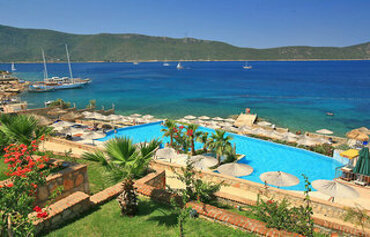 This 5 star luxury spa resort is set in lush gardens, directly on the seafront on the outskirts of Bodrum. It mixes a relaxing vibe for adults with plenty to entertain the children too. When it comes to comes to waterbased fun, you have got the choice of no less than three pools. 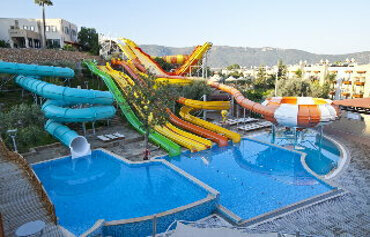 There is the aquapark pool with its nine waterslides for family fun. 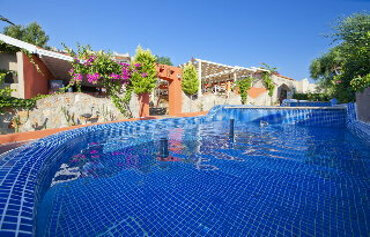 The two rectangular pools are lined with sunbed filled sundecks, the perfect places to top up your tan. On dry land, there is a mini club and play area for the children and an indulgent spa area and abundant sports facilities for the grownups. You can eat your meals in five different restaurants. The main restaurant is a buffet style affair. 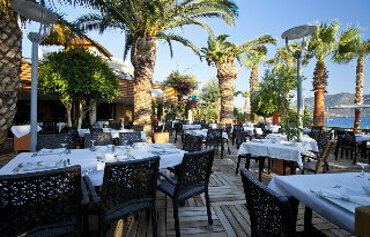 Or go down the a la carte route and tuck into Turkish, Italian, Mexican and Fish specialities. If you get peckish between meals, snacks and light bites are on the menu too. In common with the rest of the hotel, the guest rooms have undergone a recent makeover. Think neutral decor, modern furnishings, wooden floors and all the latest mod cons. Or why not upgrade to a suite and enjoy extra special touches such as a large sea view balcony with its own Jacuzzi? When the sun goes down, sit back and relax with a cocktail in the bars. The line up of evening fun includes a mini disco, live music and shows. Discover why the Ersan Resort & Spa is a popular place to stay for spa breaks in Turkey. 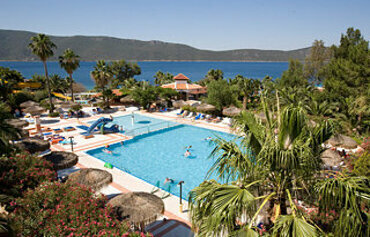 The Ersan Resort & Spa has all the facilities you would expect from 5 star all inclusive holidays in Turkey. Highlights include: Two large outdoor swimming pools with sun terraces, sunbeds and parasols, indoor pool, beach with umbrellas, deckchairs and beach towels, aquapark pool with nine waterslides, kids pool, buffet restaurant, four a la carte restaurants, five bars, spa centre with fitness room, Turkish hammam, massage, body treatments and steam bath, amphitheatre, room service, shopping mall, beauty centre/hairdresser, 24 hour reception, car rental, mini club age 4 to 12 years, playground, cinema room, free WiFi internet in the lobby, Sports facilities are: table tennis, tennis, basketball, mini soccer, mini golf, garden chess, waterskiing, surfing, parachuting, canoes, banana boats, ringos, diving school, pool, pedaloes, aerobics and darts. The hotel has 395 modern and stylish guest rooms. All rooms have twin bed/French bed, shower/WC, direct dial telephone, TV with satellite channels, minibar, balcony, hairdryer, air conditioning and free safety deposit box. Bed linen is changed three times weekly and the towels daily. The Panorama Restaurant serves an open buffet for breakfast, late breakfast, lunch and dinner. There are four a la carte restaurants: The Turkish style Turca Restaurant, the Italian style Casa Mia Restaurant, the Mexican style Tapas Restaurant and the Alarga Restaurant, which specialises in fish dishes. There are five bars: The Pruva Bar, Disco Bar, Tuana Bar, Aqua Bar and the Breeze Bar, for all your hot and cold beverages. 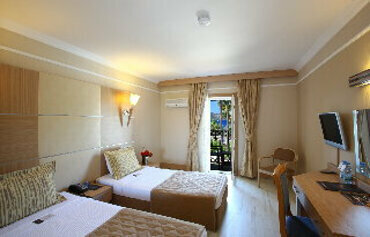 The Ersan Resort & Spa is located 4.5kms from the centre of Bodrum and 45kms from Bodrum Milas Airport.